Discover Heidelberg on our guided tours and let us show you why this city on the Neckar River has been fascinating visitors from across the globe for centuries. Between the Kornmarkt (Corn Market), Alte Brücke (Old Bridge) and Alte Universität (Old University), we will lead you through the narrow lanes of the enchanting Old Town, which is still arranged along the original medieval plans. At Marktplatz (Market Square), which is bordered by street cafés and home to the historic town hall, you will learn, among other things, why a statue of Hercules decorates the fountain in the centre, why the shape of a pretzel is eternalized on the Heilig Geist Kirche (Church of the Holy Spirit), and why this church has two entrances right next to each other. From the Alte Brücke, you will have a fascinating view of the ruins of the Heidelberger Schloss (Heidelberg Castle). This was one of the main reasons why Heidelberg rose to become the centre of German Romanticism. 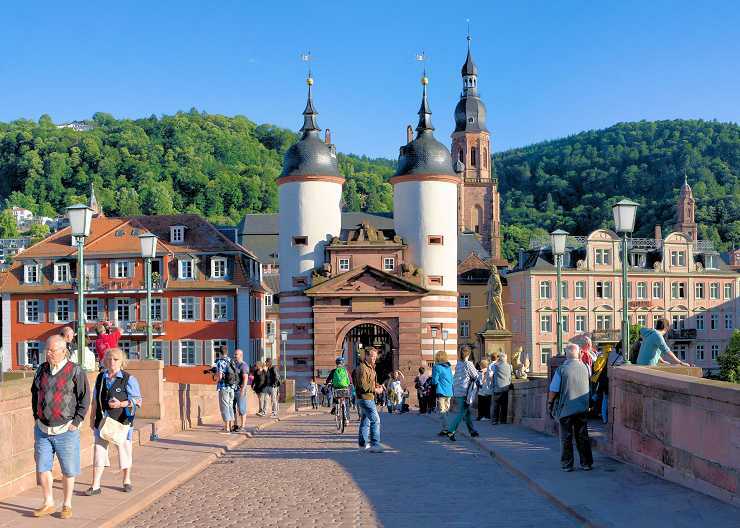 When you gaze at the Neckar River, the city lying behind it, and the red sandstone ruins towering majestically over the valley, you will understand why new visitors love to come to Heidelberg every year. When you leave the bridge, be sure to pay a visit to the bronze sculpture of the bridge monkey, for legend has it that whoever strokes the fingers of its right hand will definitely come back to Heidelberg. At the Neue Universität (New University) with its Hexenturm (Witches’ Tower), the last remains of the medieval town fortification, your tour guide will explain how this seat of prince-electors gained in international significance when the university was founded in the 14th century. The Studentenkarzer (Student Jail) bears special witness to student life in the 19th century. The inmates of this university prison for perpetrators of minor offences immortalized themselves on its walls. It can be visited in the context of our tour for two or more hours for a modest admission fee. All around this university, which is the oldest university in Germany, you will come across the traces of prominent residents and guests of Heidelberg, such as Martin Luther. His famous Heidelberg disputation of 1518 is commemorated by the Luther plaque on Universitätsplatz (University Square). Famous alumni, including Hannah Arendt, Helmut Kohl and Joseph von Eichendorff, have likewise left their traces in this city. The tour can be extended to include a visit to the birth house of Friedrich Ebert, the first president of the Weimar Republic. This house now serves as a museum. A mere glance at its back yard conveys an impressive illustration of the living conditions of ordinary craftsmen in the late 19th century. Beginning with a tour duration of two hours, we will show you around the university with its venerable halls through which some 30.000 students circulate today. With a bit of luck, it may even be possible for us to visit the Alte Aula (Old Auditorium) in the Alte Universität (Old University). A visit to the Studentenkarzer (Student Jail) is also possible during our tour. A ticket for entrance to the Karzer and the Alte Aula can be purchased at the door. It costs 3.00 € per person and also includes admission to the university museum. If you would like to visit the Alte Aula and the Karzer during your guided tour, you should plan a tour duration of at least two and a half hours. Or cross the Neckar and visit the Liebesstein (Love Stone), to which lovers symbolically attach their locks and then throw the keys away. Here, one can also visit Matthäus Merian’s copperplate engravings of views of the town or visit the Schlangenweg (Snake Path), which goes up the Heiligenberg (Hallowed Hill) to the scenic Philosophenweg (Philosophers’ Path). If you extend your tour, you will have time to ascend the slopes of the Königsstuhl (King’s Chair) and take a guided side trip up to Heidelberg Castle. Please tell us if you are interested. You can cancel your reservation or have it changed. If you cancel your reservation at least one week before the date agreed for your guided tour of Heidelberg, there will be no additional charge. If you cancel it less than one week but at least one day before the agreed date, we will charge you 50 % of the agreed fee. If you cancel on the day of the tour or do not appear at the agreed time and place, we will charge you the entire agreed fee. 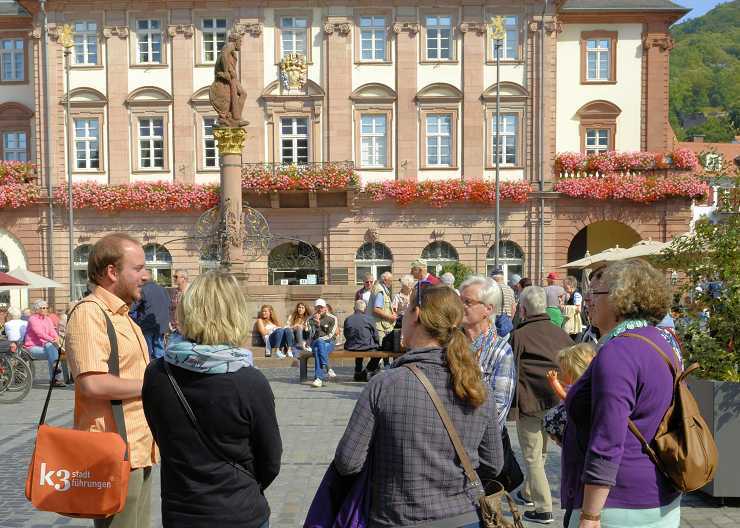 Changes can be made up to five days before your guided tour of Heidelberg at no additional charge. If you wish to change the time and/or meeting place less than five days before the tour, we will charge you 20.00 € for this change. Then, the time of day may only be changed by at most two hours (either way).